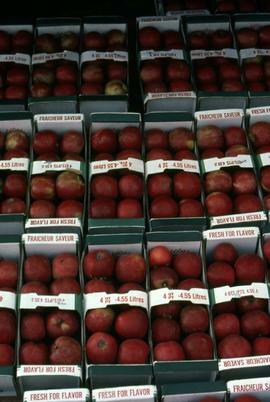 Colour Kodachrome 35mm slide depicts many cardboard boxes of red apples. Colour Kodachrome 35mm slide depicts a table with different types of dried and candied fruits and other sweets. Colour Kodachrome 35mm slide depicts a table with desserts on it, including a model of a panda made from dessert and a dessert with several Norway flags sticking out of it. This image was likely taken on a cruise ship. Chocolate box tag assumed to have come from one of Private Seidelman's letters from July 1917. This particular tag is for the Tobler chocolate company (later becoming known as the Toblerlone chocolate company). 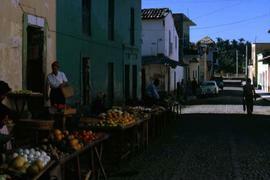 Colour Kodachrome 35mm slide depicts crates of grapes an other fruit in and outdoor market in South Africa. Kodachrome 35mm slide depicts a variety of unidentified lentils, beans, and seeds, in Jerusalem, Israel.